Be the first to share your favorite memory, photo or story of Justin . This memorial page is dedicated for family, friends and future generations to celebrate the life of their loved one. 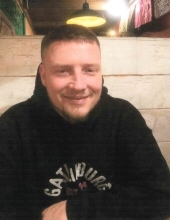 Justin F. McCulley, 32, of Felicity, passed away on April 7, 2019. Born July 9, 1986, in Cincinnati, OH. Beloved fiancé to Heather Swearingen; son of Allen (Donna) McCulley and Dawn (Mike) Brown; loving father of Hunter, Brody and Ayden McCulley, Brayden and Claire Tsanges, and the late Brycen McCulley; brother of Jerry, Stetson, Cody, Robert, and Richard. Justin is also survived by several nieces, nephews and friends. He is preceded in death by each of his grandparents. Justin enjoyed going fishing, camping, and spending quality time with family and his dog Kodiak in his free time. He also helped coach his boy’s baseball team the past two years. Visitation will be held at E.C. Nurre Funeral Home 315 West Plane St. (St. Rt. 125), Bethel, on Tuesday, April 16, 2019, from 11:30 PM until time of funeral service at 1:00 PM. Burial Calvary Cemetery, Washington Township,Ohio. "Email Address" would like to share the life celebration of Justin McCulley. Click on the "link" to go to share a favorite memory or leave a condolence message for the family.